Kent Business School’s Employability & Placements team last week held two Employer Networking Events for second year students registered to take their Year in Industry next summer. Presentations from recruiters, KBS graduates and current interns from PwC, EY, GSK, Cummins, Rackspace, Coty and Egress Software Technologies gave students insight into these businesses, their application processes, and placement opportunities. 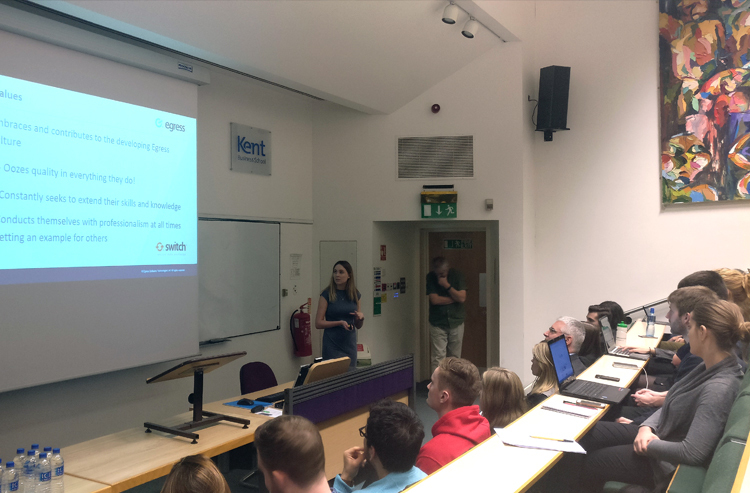 The presentations took place in the Kent Business School Lecture Theatre in Canterbury, and were followed by an hour of networking in the KBS foyer. This was an invaluable opportunity for students to acquaint themselves with placement schemes on offer and introduce themselves to potential employers. “Through attending the employability networking session, I was able to meet many different companies that were very diverse in their placement offerings. It gave me an interest in companies that I had initially never considered before and was a huge eye opener and a great opportunity to meet people with experience and knowledge about each company.” – Georgina Barnfield, BSc Marketing student. “The employer networking event gave me access to a new pool of placement year employers. It also gave me a chance to practise my networking skills.” – George Kennedy, BSc Marketing student. A similar event was held in The Royal Dockyard Church Lecture Theatre on the Medway campus earlier in the week, with staff and interns from BAE Systems, PwC, Rackspace, MacIntyre Hudson, Disney, and Nissan, and a large number of students in attendance. The events highlighted a large number of potential opportunities for the Kent Business School students in attendance. Congratulations to the KBS Employability and Placements team for organising such successful events. Find out more about the Kent Business School Year in Industry scheme and additional employability support available to KBS Students.